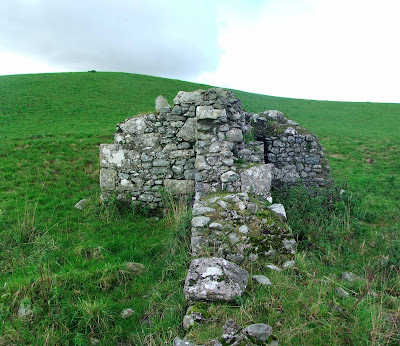 The remains of Cappelside Hall, as mentioned in the original post some time ago, are hidden, off the beaten track, and otherwise not accessible. 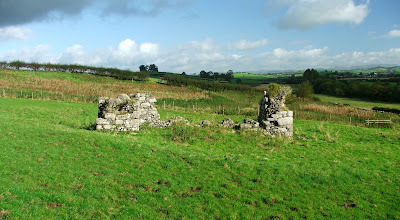 The remains can be found at the foot of a hill in a field, sandwiched between Paradise Lane and Pool Darkin Lane, just off the A6 near Beetham Garden Centre. There isn't parking readily available nearby, so a walk is required. Once over the brow of the hill, and heading South East across the field, the remains can be seen at the foot of the hill before you. Basically, you're looking at the remains of the South end of a hall house, constructed some time during the 1400's, possibly on the site of an earlier building. 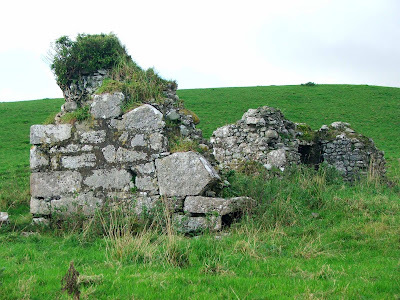 The Hall and its tower would have stood around 11 and a half metres by 7 and a half metres, with walls somewhere around a metre and a half thick. 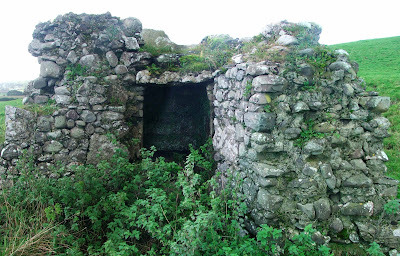 View of the garderobe in the South Western face of the pele tower's single surviving wall. View of the South Eastern wall of the pele tower. View from the West, showing the Southern surviving wall. The garderobe entrance can be seen at the top right of the photo. At this part of the wall, the stone plinth upon which the tower was built can be seen in the grass. 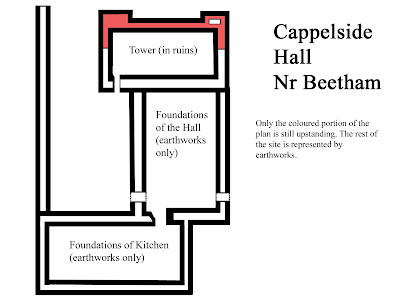 Map of the layout of Cappelside Hall, based on Curwen's work. Some of the layout is probably pure conjecture on the part of Curwen, but there are earthworks all over the site, suggesting buried walls and features. 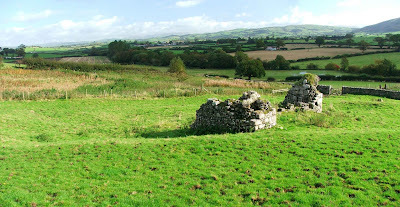 A shot of the only upstanding remains of the pele tower from the West looking down Cappelside Hill towards the direction of the Garden Centre. It's interesting to note, that the remains do not appear on the map...strange that such an important manorial site does not get a mention!!?! However...if you look carefully at the map, just above the A in Cappelside Hill...there is a curious [ shape....perhaps indicating the edges of the building! There are feint earthwork remains to the North West of the standing remains, representing a kitchen block, and a larger hall block....all now long gone. These two areas were dismantled in 1687, when the property passed by marriage to the Cliffords. The tower was converted to use as a barn at this time. Parts of the surviving walls stand to around 12 feet at their tallest, whilst the rest are either ground level or just above. A fence that runs to the East of the remains seems to be mounted on what looks like an old wall boundry, long since dismantled. I wonder if this is a boundary that would have been in existence when the hall was being used. As well as this, there are mounds of masonry against the walls to the north of the remains, possibly parts of the original buildings. This visit to the remains was much better, yielding a better set of photographs. This is serious - near-field survey - stuff. Reminds me of old times (mainly north of Border). Having been again thwarted in my own weekend trip, I live through yours! Await next post eagerly.